The concepts of petit bourgeois and materialism are nothing new. In a country like Australia, where ideas like multiculturalism and diversity (of people and thought) are discussed frequently, it’s amusing to me that people still aim generally for the same trends, styles, possessions and ideals. Today, the objects of mainstream materialist desire are quite different, although the desire is virtually the same. In the place of the radio and the internal combustion engine, we now see digital technologies and trends as cool. Many people ‘need’ to have the latest, most expensive iPhone, which facilitates amazing, creative and technical applications—yet most people just use theirs for Instagram. Even then, with such an impressive camera module, people still manage to take and post rubbish photos. You can achieve that on an Android handset that costs much less but of course, there’s no brand prestige there. The bit that stood out to me about Orwell’s quote was his reference to cheap clothes. Somehow, cheap clothing has been rebranded as desirable and fashionable, even with collective knowledge of the suffering that its makers endure, perhaps sometimes worse than in the technological supply chain. Circling back to Australia’s own brand of petit bourgeois, we can even see the integration of literal Frenchness into nationwide idioms and advertising terms. The retail chain Target is no longer just Target; it has been pronounced both mockingly and seriously as Targét with a silent ‘t’ for some time. Even one of the brand’s advertising campaigns adopted this pronunciation to relate to Australian consumers. It worked a treat and everyone was talking about it. Wesfarmers owns Target in Australia and also operates Kmart, which has generally been seen as the more budget-angled alternative. With recent aggressive TV advertising, however, I would argue that they are using the same fun, aspirational middle-class-focused strategy to turn Kmart into a brand with its own silent ‘t’: KmÀrt. Yep, that’s a brilliant artwork. Also, it looks great next to the golden lamp. Rightio, hello to you as well. ‘Very pretty’ and ‘pretty’? Is this a comment that the French are prettier than the Spanish, or are people meant to grade themselves prior to purchase and select the top that best matches their own physical appearance? All of this stuff is just plain tacky. With regard to the big print of the woman, I am by no means a snob when it comes to art; I have purchased prints from Ikea and don’t believe that expense always correlates with quality. Opening a debate on art is certainly not my intention but surely you could find something more genuine or interesting to put in your home than this. What I find concerning is the way that people mindlessly scoop up such items, using them to project false styles and realities that match their constructed realities on Instagram. In people’s relentless efforts to stand out, they end up all heading to the same retail chains. In an increasingly globalised society, I know that it’s sometimes difficult to avoid shopping at the exactly the same places, eating similar food and sharing familiar ideas online. This piece certainly isn’t the first ever to discuss consumerism. I’m just asking that people think about the meaning behind their decisions, consider the value of difference and at least occasionally aim for something a little radical: be satisfied. Australia has some of the most unique and beautiful wildlife. Growing up surrounded by eucalypts, I awoke to the sound of myriad birds every morning. 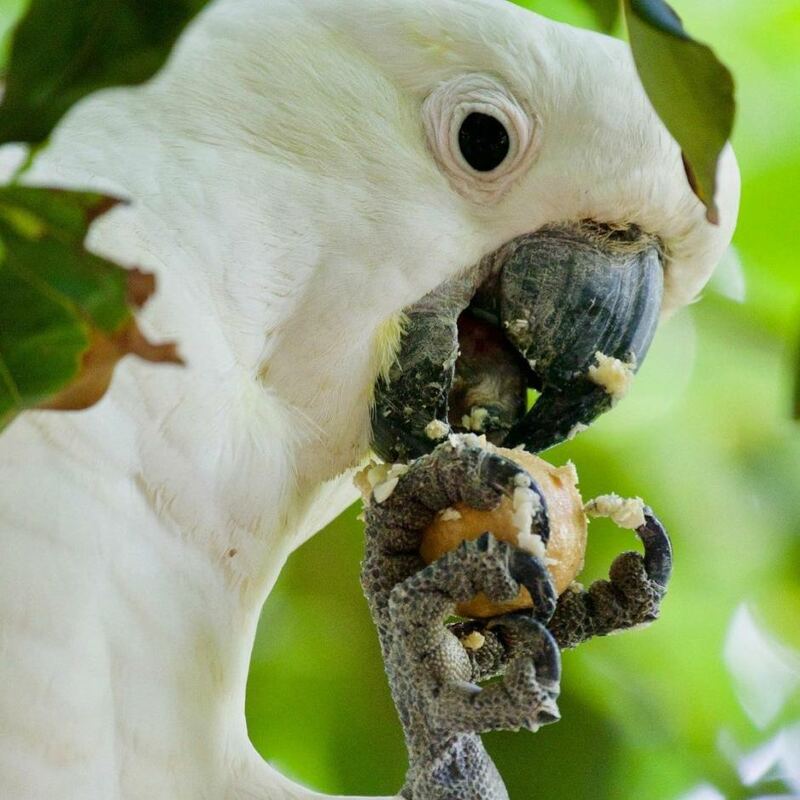 Whilst people seem united on the evilness of the magpie, one bird that divides people, is the sulphur-crested cockatoo. Many find their screeching annoying and fear that they will nibble and gnaw on their timber railings, whilst others find them cute and comicAl. I think that they’re absolutely gorgeous and I love to watch them. This photo (submitted by Backyard Zoology on ABC Open) perfectly captures their personality and I couldn’t help sharing it. They’re kooky, they’re majestic and they really know how to crack open macadamias. We have a macadamia tree outside our unit and the way that they break through those nuts is unbelievable. It puts humans to shame. Recently at a market in Sydney I came across a stand for Joco. I had never heard of the company before but I couldn’t help but roll my eyes when I saw what they were selling. We seem to live in an age of needless, overblown reinvention by hipsters. Like the time when Uber essentially claimed to have invented the bus, we’re witnessing the bizarre promotion of pretentious products, all of which are sold under the exaggerated (and often inappropriately used) labels of ‘bespoke’, ‘artisan’ and ‘organic’. How such products survive without any kind of unique value proposition is beyond me, particularly when they’re sold at ludicrous prices. Frankly, I believe that it all comes down to rampant consumerism and personal obsession with status. One of the most confusing things that patrons tend to encounter in any new café is whether they should wait at the door for someone to seat them, proceed to the counter or find a table by themselves. Clear signage at the entrance is key to avoiding such doubt. Every now and then I encounter a situation where conflicting information is displayed. Take the example below; each image shows a different sign in the same café. The particularly hilarious thing about this example is that the signs are in separate rooms, facing different entrances. Not only are patrons likely to be confused—especially if they spot both instructions—it’s also possible that staff will be uncertain as to which people have already been greeted and served. It’s a mess. I continue to be flabbergasted at the total lack of common sense in the most banal of social circumstances. For many years, I have been perplexed by the archaic sign-in system at Returned and Services League (RSL) clubs in the Australian state of New South Wales (NSW). Governed by the Registered Clubs Act 1976, which is based on even older tripe, there is a strict procedure for entry, which stipulates that all visitors must declare themselves as members, temporary members or guests. There are even further definitions, such as ‘honorary member’, ‘life member’, ‘full member’, ‘ordinary member’ and ‘provisional member’. Anyway, the idea is just to pay to become a member and do the fancy swipey-thing with your membership card to earn discounts and win meat trays. Of course, there’s the simple logic that if a sign is up somewhere to say that you shouldn’t be doing something, then that thing has probably occurred in that place before. According to this sign, torn clothing and leotards must have been worn in the past. It almost sounds like a post-apocalyptic remake of Flashdance. Let’s move on to some of the linguistic errors. Regarding spelling, two possessive apostrophes are missing where it says ‘MENS SINGLETS’ and ‘MENS HEADWEAR’. Furthermore, three sentences are missing full stops and a number of common nouns are regarded as being so important that they have been transformed into proper nouns, such as ‘Club’, ‘Dress Rules’, ‘Dress’ and ‘Behaviour’. Moving on, let’s address some of the other inconsistencies on this sign. The specific reference to men’s wearing of singlets and headwear suggests that women are in fact permitted to wear singlets and headwear, which makes no sense at all. The mention of no offensive shirts (rather than no offensive clothing in general) suggests that one may wear offensive pants. The small white amendment over the baseball cap circle—in case you can’t read it— states that ‘HATS ARE PERMITTED IN THE CLUB, THEY MUST BE REMOVED IN THE BISTRO AREA’. It is unclear as to whether a hat (in the eyes of the club) only refers to baseball caps or actually refers generally to all headwear, in which case this would cancel out the later restriction of men’s headwear. What is a bistro ‘area’ anyway? Does this include some mysterious no man’s land that extends beyond the specified border of the bistro itself? Is there a customs check or airlock of some kind? I’m also puzzled as to what would happen if someone were to enter the club at say, 7:25 pm, with the last restriction stating that overalls are not permitted in the club after 7:30 pm. Must a person who was permitted to enter with said overalls prior to 7:30 pm then leave the premises very shortly afterwards, or are they permitted to remain in the club, provided that they refuse to use offensive language and then remove their clothes, as stipulated in the sign’s aforementioned penultimate sentence? Last of all, I do wonder at what time the restriction on overalls is lifted. One could assume that it resets at opening time the next day, however I am disturbed by their failure to address this point, given the specific nature of their other demands. If you’ve made it this far, then surely you agree that all of this is a tad ridiculous. I’m being quite pedantic here but NSW has insisted on establishing the confusing RSL equivalent of Checkpoint Charlie at all entrances. No other type of venue on the planet offers paying visitors such a bizarre welcome and recipe for entry. Do they even want our money? I hope that the NSW will improve its club sign-in procedures and dress code explanations in the future, so as not to treat visitors like a pack of dullards and criminals who may or may not be permitted to enter naked. landing people on the Moon. Whilst at a robotics competition on the weekend (as a spectator), I spotted these two bins. They stood in the doorway to a room full of super-intelligent competitors; one was overflowing whilst the other (emptier) one was right next to it. As you can see, it was only slightly obscured around the corner. What caused this? Dimwittedness? Poor eyesight? Suboptimal arm reach? I think not. It all comes down to laziness. On and off during the day, I watched numerous people—young and old—approach the overflowing bin with a look of hesitation and disgust. Most decided to carefully balance their filth on top of the pile rather than look around the corner. Some even performed the classic crushing ritual. Others let their rubbish drop onto the floor. The picture above was taken towards the end of the day, when the emptier bin was slightly closer to being full. Yes, I could have acted but then I would not have been able to report my observations to you. In an age when everyone is losing their minds at the prospect of a new age of tech disruption and artificial intelligence, built on the brilliance of automated Gen Y and Z start-ups whose founders are innovative, digital natives raised on nothing but kale-and-ginger-based vegan snacks, I think that we should adopt a much more realistic outlook. Humans are lazy and nothing is going to change that. Perhaps the dawn of our new age of artificial intelligence will lead to solutions for this… consider a new robot assistant that could manage such refuse (or at least point humans to the nearest empty bin).